Please inform us about your thoughts of this spell changes. Item Shop will be free for the time Beta is online. If you find any bug or have any suggestion about our game please write a post on our forum or contact administration directly in the game. Beta Tests will start tomorrow (09.04) at 6PM CEST and will stay online for atleast a week. Experience and skill gain will be 10x faster as we would like to focus on PvP and late game. Everyone is welcome to join us testing and balancing stuff, all suggestions matter. You can create your character now. Current edition will end on 08.04.2019. Thank you all who have played and are still playing while I'm writing this post. 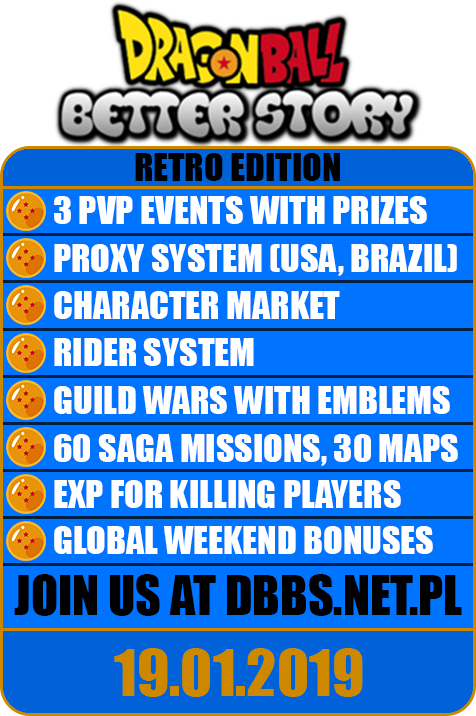 We are planning another Retro edition which will probably start on 01.05.2019, but this time we will put a lot more effort in balancing PvP and overall gameplay experience. To help with that beta tests will come online somewhere in the middle of this week (09.04-11.04), we will inform you with the exact date later. Thank you all again and hope to see you on the next edition! Piccolo and Dende will now have to wear 2 distance weapons to get full damage. Furthermore, all distance weapons that adds attack speed skill have its values reduced by half. We did this change because it was not fair that only 2 professions out of more than 20 were able to upgrade just 1 weapon to get its full potential. 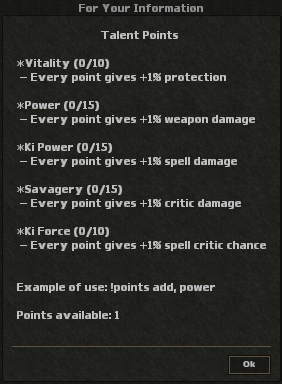 quite some changes has been applied today including overall damage reduce from melee/dist damage and slightly increase to spell damage. In addition, all vocations has been adjusted to match their attributes on profession page. Delay to attack new target has also been changed. It is almost 3x longer now. I was unable to hold the tournament this weekend due to personal problems that occured. 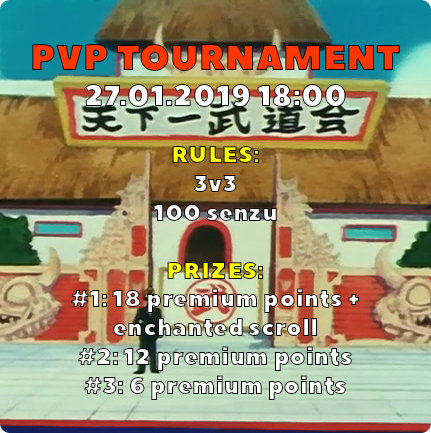 Tournament will take place the next saturday (02.02.2019) instead. To compensate this unfortunate event there will be +25% skill bonus for a week. Talent Points system has been changed. All your points and bonus stats have been resetted. Please allocate them again. Dragon Ball Better Story Retro Edition will start at 19th January 4PM CET. Many of you have been asking us about resurrecting this edition and we finally decided to deliver! In this version of our server you will be able to get this nostalgic feel, hunt old monsters, make new friendships and fight your enemies just like in old times. and pretty much everything else as Retro Edition would suggest. Create your character now and join us at 19th January! Win one of 20 codes each worth 15 premium points by liking and commenting our facebook post! Double your chance to win by sharing it on your facebook timeline.